A ballsy record outta Cleveland. 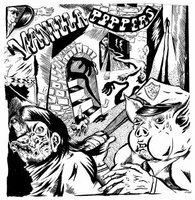 Driving upbeat charm of The Ramones backed with the vile grit of Amdi Petersons Arme. Plenty of half stepping all over the fretboard. The whole rhythm section on this album makes me shake my head, unbelievable. Lives up to the legacy of their city.